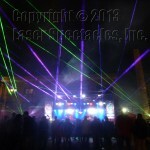 Laser Advertising | Laser Spectacles, Inc.
Laser Spectacles was hired back at Mardi Gras Galveston in 2013 to add laser effects to the Jagermeister Stage at 21st Street and Strand Street. 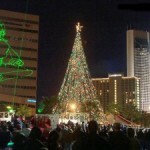 The weather was better this year – no rain, and not so cold! 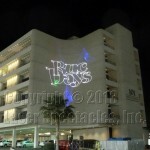 Laser Shows on Buildings – Good Idea! When we look at a site for the first time, we are always keeping an eye open for what buildings are in the area. Buildings can be the most stable and reliable laser screens, and often have a historical connection with the community that adds an extra dimension to the laser show. Plus, lasers can project very, very large, and we are looking for something to showcase that impressive ability – often the right building will add a substantial WOW factor to the laser show. And that is something that everyone is looking for! 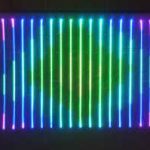 Want a custom quote for a laser show at your upcoming event? Click here for our "Book A Show" form page. Find us on Facebook, Twitter, YouTube! © 2019 Laser Spectacles, Inc.